The shared use cycle path along Witchford Road crosses two side roads; Norfolk Road and Pilgrims Way. Both of these junctions do not give cyclists an ample view of oncoming traffic at the point where the cycle path crosses the side road. The Norfolk Road crossing is particularly bad for cyclists travelling out of Ely.To get a proper view of any oncoming traffic requires going out into the road. We propose that these junctions are redesigned. Replacing the sweeping corners with squared off ones, allowing cyclists and pedestrians a much better view of oncoming traffic and also forcing the road traffic to slow down to negotiate the junction. The traffic island in the middle of Norfolk Road is redesigned as it’s too narrow to be used by cyclists especially those using trailers or trail-a-bikes. Ideally we would like the ends of Norfolk Road and Pilgrims Way to be raised making it clear that there is a cycle route crossing the junction and helping to further reduce the speed of traffic using the junctions. The junctions in question lead from a 30mph road ton residential areas, however the sweeping corners allow drivers to take the junction without reducing their speed. This is dangerous for cyclists and pedestrians crossing the junctions. The sweeping corners also means that the view at the point where the cycle lane crosses is severely restricted. This is the view on the approach to the Norfolk Road junction. There is virtually no view of any oncoming traffic that may be on coming along Norfolk Road. Additionally any oncoming has no indication that there is anyone approaching the junction about to cross. 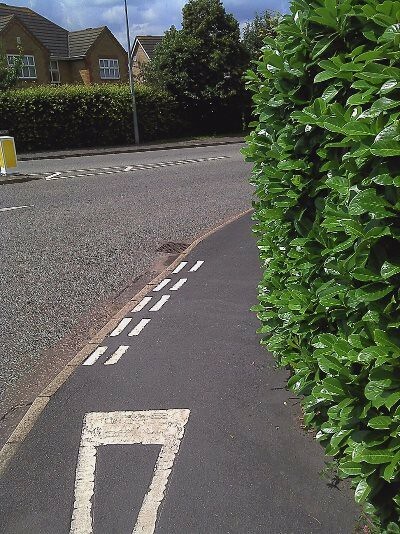 Given the sweeping corner most motorists are looking right to see if they can pull straight out rather than looking for cyclists or pedestrians about to cross from the left. This is the view along Norfolk Road when standing on the edge of the pavement at the cycle crossing point. 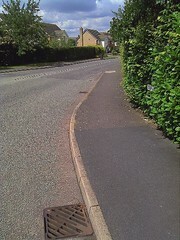 This is the view from the edge of the pavement where the cycle path crosses the junction. There is about 4 cars length warning of oncoming traffic at this point. Anyone wishing to cross has to venture out into the carriageway in order to get a good view. 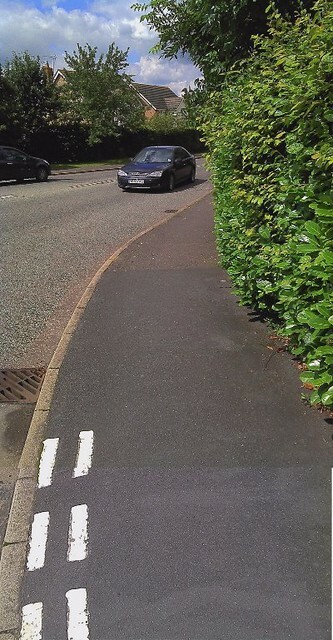 The picture below shows how far from the kerb you need to be to get the view on the right.